Two ITT Goulds Pumps Products have been named finalists in Plant Engineer’s 2018 Product of the Year Awards. At Hayes Pump, we proudly support Goulds Pumps innovative efforts to continuous improvement by developing award winning pumping solutions. Read about these products and contact Hayes Pump for assistance understanding how these products can help with your applications. To get superior MTBF you need two things: Optimum pump hydraulics and a robust pump structure. The new i-FRAME housings delivers on the second point by providing a premium robust housing with unique new and improved features that raises the bar on what you can expect from your pump’s long term performance. These i-FRAME bearing housings include the new patented one piece design bearing housing for the ball-ball bearing arrangement, as well as the patent pending split bearing housing for the sleeve-ball and sleeve-tilt pad bearing arrangement. The i-FRAME bearing housings have enhanced air cooling with axial fans and achieves metal and oil temperature reductions of up to 30° F from previous design without the need for cooling water. All shaft ends on the NDE side come standard with a guarded extension to accept a fan for ease of field retrofit, so if your process needs change the fan can be fitted without the need for expensive pump disassembly. The VICR, an API 610th VS6 vertical multi-stage low flow, high-head pump is a reliable and compact pump for high-head applications with extended life and easy maintenance. 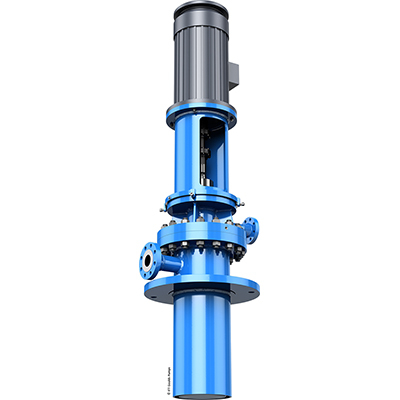 The VICR has a competitive advantage due to its compact design and reduced number of stages from the radial impeller configuration that can produce more head per stage. The compact product configuration with a small footprint is ideal for installations with limited space. Swirl breakers in the suction bell that allow smooth entry of liquid into the first stage impeller eye. 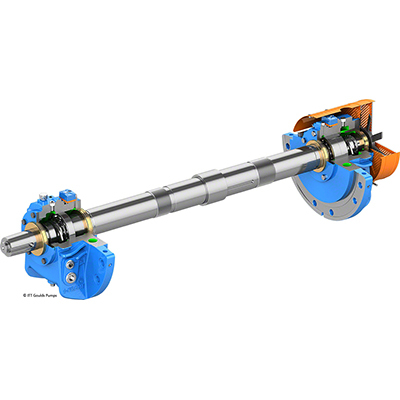 High suction pressure/Up-thrust: Patent pending dual bearing arrangement that handles rotor up-thrust and to keep the shaft straight under high suction pressure including a thrust balance device with non-galling running clearances. Developed with Pro-E modeling in 3D to achieve effective data mapping and design visualization. Dynamic flow models that ensure stable performance and consistent high efficiency levels. The VICR has a competitive advantage due to its compact design and reduced number of stages from the radial impeller configuration that can produce more head per stage. Contact Hayes Pump for more information on pumping solutions for your applications. This information provided by Plant Engineering and Goulds Pumps.